Those awaiting results of April 2015 Electronics Engineering (ECE) and Electronics Technician (ECT) board exam may find here full list of passers, top 10 (topnotchers), top performing and performance of schools as the Professional Regulation Commission (PRC) and Board of Electronics Engineering (BEE) announced results on Friday, April 17, 2015 or in 3 working days after the exam. PRC on Friday announces that 892 out of 2,552 passed the Electronics Engineer Licensure Examination and 1,066 out of 1,483 passed the Electronics Technician Licensure Examination. The members of the BEE are Engr. Alnar L. Detalla, Chairman, Engr. Enrico Claro R. Delmoro and Engr. Herminio J. Orbe, Members. 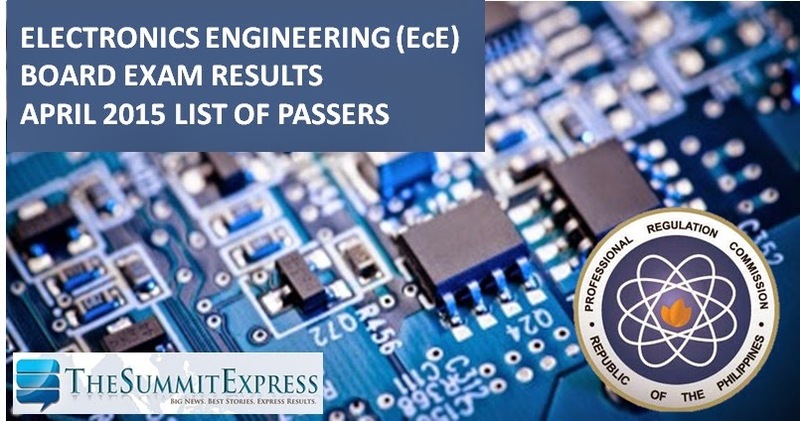 The Electronics board exam, considered as one of the hardest exams in the country covers the following major discipline Mathematics, Electronics Engineering, General Engineering and Applied Sciences (GEAS) and Electronics Systems and Technologies (EST). Programs for electronics technician board include basic math, electronic and electrical equipment, Philippine Electronics Code and Electronics Engineering Law of 2004. In March 2014, results were posted online in three (3) working days after the last day of examinations. A total of 907 out of 2,574 passed the electronics licensure exam and 969 out of 1,488 who passed the electronics technician licensure examination.